A year long 'mystery' concludes with no satisfying resolution for Subor's inscrutably silly Famiclone handheld. ​If you can penetrate its inscrutable sign-up process (and you happen to live in China) then the Chinese shopping website Taobao can be a source of infinite treasure for the discerning retro gamer. It was on Taobao that I arranged to have my Neo Geo Pocket Color modded with a front-light. It was on Taobao that I picked up a the cheap PokeFami DX that has since become my permanent SNES clone of choice. It was also on Taobao that I took a gamble on what appeared to be a knock-off Game Boy Advance for the relatively low price of 30 RMB. The box was promising, offering “appearance of high accuracy color", which is always nice, it also looked like it might offer the comfort of the original GBA model with the advantage of a backlit screen. I should have done my research, but, of course, it was only 30 RMB. A drop in the confusing Chinese tech ocean. The Game Theory Admiral was duly delivered and right away the box should have given away that something was not quite wired correctly. Not just in the console itself, but possibly in the brains of the manufacturer. The Game Theory Admiral's box attempts to enter the Guinness Book of Records for most warnings on the outer packaging. The manual, which certainly lives up to its "mystery" billing, given the ever ludicrous translation and outright lies contained within. Considering myself warned, I opened it up. 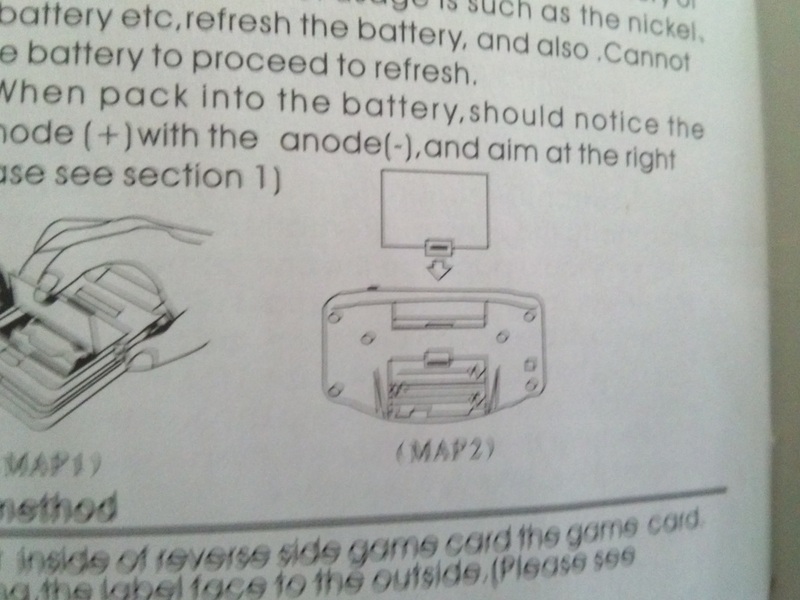 ​The instruction manual, translated into full ‘Engrish’ with a mangling that would make the GameKing blush, carried a further three pages of warnings! Still it looked simple enough, plug in a cart and Bob’s your uncle, right? I tried a GBA cart. It wouldn’t fit. Scratching my head, I tried a Gameboy Color cart. It didn’t fit either. Nope it wasn't emulating a C64 loading screen. I went online and did my research and the ‘Mystery’ mentioned on the console’s box started to become rather apt. 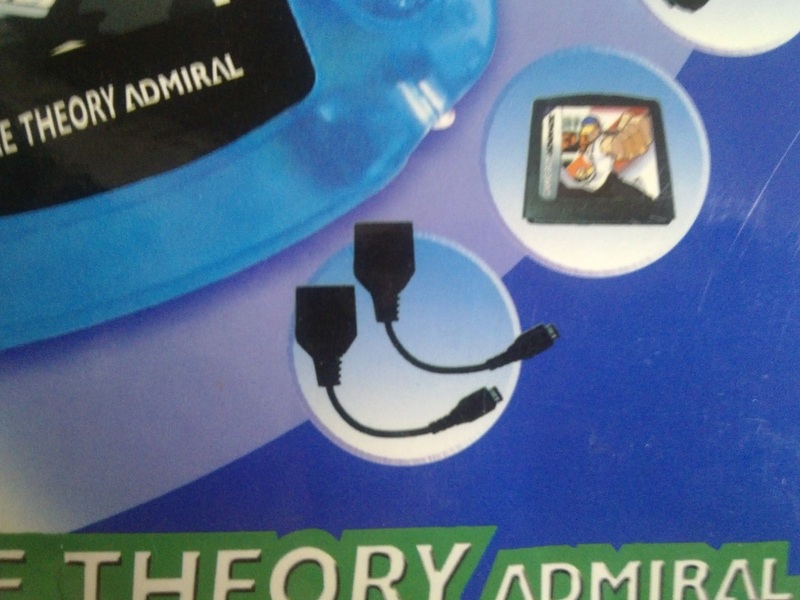 The Game Theory Admiral, despite its appearance and indeed the cartridge displayed on the box art, is not a GBA clone. It is an early attempt at a handheld Famicom. Despite everything that the box and instructions clearly seem to state, the only cartridges it takes are Famicom carts. Perhaps it was once possible to get carts that fitted it’s tiny slot, or perhaps these were planned and never actually manufactured. However from everything I read online it seemed that the only things that the system could do was play original or knockoff Famicom carts. Of course, nothing was going to be that simple. Clearly a Famicom cart wasn’t going to fit into that little cart slot either. My 30 RMB investment was missing something. 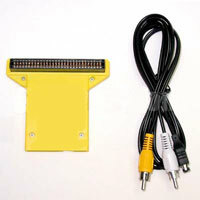 In order to plug a Famicom cart into your GTA, a yellow bridge adaptor first needed to be plugged into the system, the cartridge would then rest over the top of the console looking like some bizarre sun-guard. Lying manual lies about cartridges that do not exist! Lying box art with artist's impression of make-believe cartridges (note how they even went so far as to doctor a Game boy Advance logo on the cartridge in question.) Those two joystick adaptors are also not included, although the GTA has two such connection ports suggesting they might be obtainable. I checked the box again. No such adaptor had been supplied to me. I emailed the seller who ranted at me in broken English that I should have read his description better. In the year that has passed since I first bought the GTA I have seen several for sale on ebay, Taobao and other websites. I have never seen a single one of these legendary adaptors being sold alongside the system! The legendary yellow adaptor (and AV out cable). Finding one of these became a year long grail quest. So, for almost a year, the GTA sat on my shelf of obsolete hardware. Unusable. A curiosity, only pulled out to giggle at the instruction manual now and again. Ocassionally I searched in vain for the yellow adaptor but no results ever came up. A few months ago, something extremely odd happened. Multiple stores on the Hong Kong based Aliexpress store started selling third party adaptors for the system. Think about that for a second. Someone Guangzhou seriously had the bright idea to mass produce an adaptor for a decade old famiclone handheld in 2016! I didn’t question the logic or the price (about three times what I paid for the system). I bought one immediately and can finally reveal that both the system and the adaptor in question share one thing in common. They are a crushing disappointment. Finally up and running courtesy of the third party adaptor. The joy was short lived. First let’s talk about the handheld itself. It’s aesthetically very pleasing with a comfortable dpad and buttons and a properly backlit screen. Unfortunately this pleasure is diminished when you turn it on and the joy of finally seeing an actual game running on the system is mired when you realise that the screen quality is poor by 2016 standards. Screen technology has come a long way since this system was launched in the early 2000’s. The cheapest emulation box handhelds available now have super sharp definition. This cannot be said of the GTA where the picture has a blurry texture to it. The brightness and contrast sliders do not do much to improve this. Unfortunately there is simply no going back from seeing the crisp beauty of most cheap Chinese NES emulation handhelds to this older, inferior technology. Sound initially appeared to be excellent on the first game I tried it on, Wizardry, with the built in speakers nice and loud. Unfortunately the sound was so bad on the next game I tried, Hoshi no Kirby, that I thought I had blown the capacitor! Further trial and error revealed that Final Fantasy VII (NES de-make version) once again had perfect sound, yet Super Mario 3-mix had the same farting bumblebee quality to it that Kirby did. As there is no headphone jack on the system, the possibility of this improving when not being pumped through the GTA’s internal speaker was not an option. Still, the system isn't just a handheld. It also came with AV out leads. Perhaps, I reasoned, the sound and display would be better if hooked up to the TV. Unfortunately this is where the frustrating experiment of the Game Theory Admiral reached its crescendo. Can you see the problem? The manufacturer apparently couldn't as he demanded to know why he did not receive 5 star feedback! Let’s talk about that third party adaptor. Unlike the original Yellow adaptor that seems to have disappeared off the face of the planet, the Aliexpress version comes with no casing. It’s a raw, extremely lightweight piece of circuit-board that always feels prone to breaking as you carefully plug in a cartridge and which wobbles in an ungainly fashion while you play. Possibly concerned about this, the manufacturer had made one further, critically poor design choice. They had shortened it from the original specs. The original adaptor was about two inches longer and, while this may have led to further wobble, it was longer for a reason: so as not to completely block the AV out port! Yes, the brilliant mind that thought it would be a good idea to release adaptors for a decade old obscurity in 2016, had neglected a crucial piece of ergonomics when designing it. It is therefore impossible to use this adaptor and the AV out cable at the same time as the one blocks the other. It is therefore impossible to play the GTA on your TV using the only adaptor currently available to allow it to play carts in the first place! Unsurprisingly, The Game Theory Admiral and it's third party adaptor have now returned to my shelf of obscure handhelds to gather dust and occasionally be sniffed at by my cats. 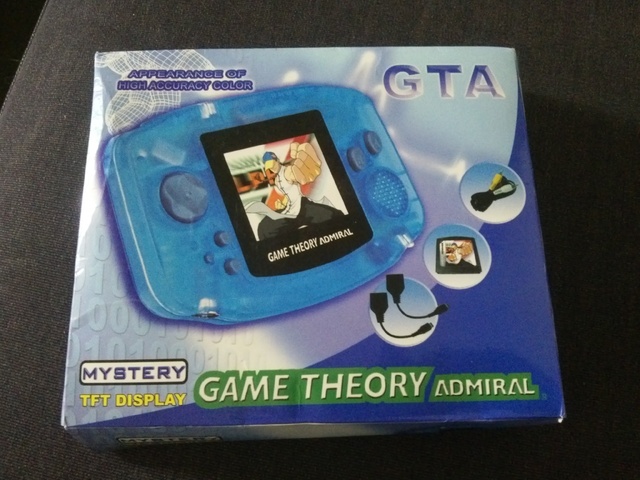 DO NOT buy the Game Theory Admiral or the knockoff third party converter with the intention of extracting even an iota of enjoyment out of it. That being said, they do make a lovely couple.